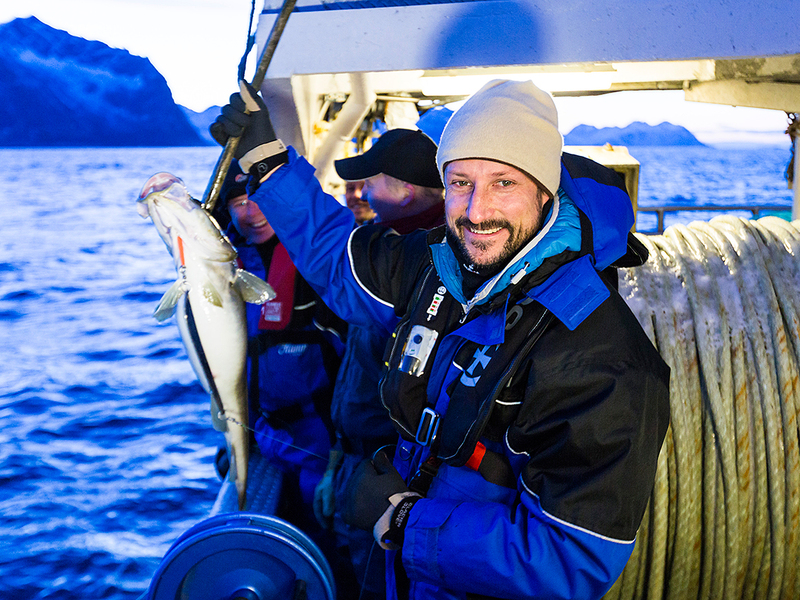 The traditional skrei fishing season has arrived, and today His Royal Highness Crown Prince Haakon took part in a fishing trip off the island Senja in North Norway on board the fishing vessel Senjaland. The Crown Prince arrived in Senja yesterday, where his visit began with a proper fish dinner. The menu revolved around skrei, of course, and the international team of chefs included Jostein Medhus of the Norwegian national chef’s team. At 8:00 this morning Crown Prince Haakon visited the fish dock at Gryllefjord. After a presentation of how the fish is processed at the doc, the Crown Prince was shown how to cut out cod tongues. This is a typical job for young people in fishing villages looking for pocket money, and the pay is good during high season. The Crown Prince tried his hand at the task, but it was clear the youths had the upper hand. Each cod tongue normally weighs in at 30 to 40 grams. Actually, most of what is cut out is the flesh of the chin muscle underneath the tongue, but the size can vary greatly. Fried cod tongue is a favourite dish along the Norwegian coast and has become featured in fine restaurants. Along on today’s tour were several chefs from Norway and abroad, who held an impromptu contest to be named the best tongue cutter. Next the group boarded the Senjaland and headed out into the fjord, joined by some killer whales along the way. Crown Prince Haakon tried some fishing and reeled in three cod and one saithe. Later, when the vessel returned home to deliver the day’s catch, it was Crown Prince Haakon himself who took the wheel and docked the Senjaland. The Crown Prince then watched how the fish are processed further, complete with fileting and packing, and also witnessed his own catch being quality-assured and approved. Before leaving, the Crown Prince met again with the chefs, this time to sample their freshly-made fish dishes. Afterwards, he met with fishermen in Finnsnes. 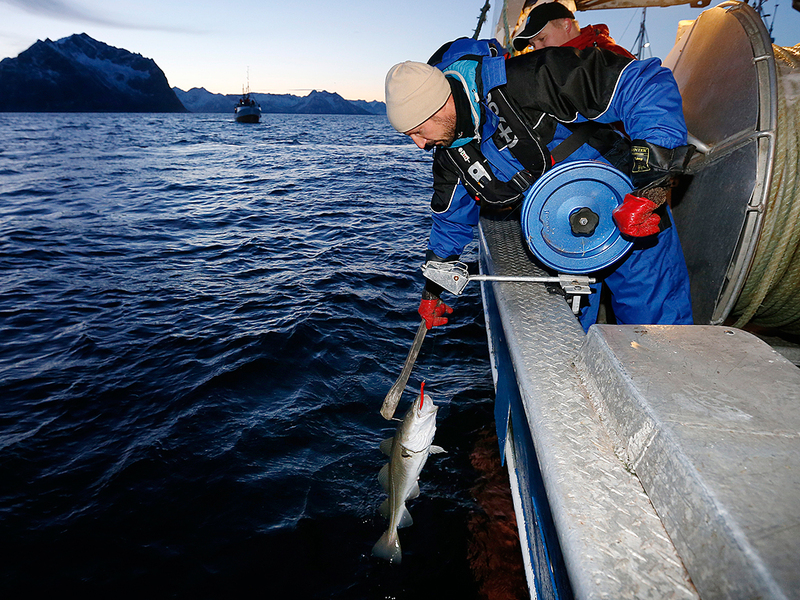 When cod migrate to the coast of North Norway to spawn, it is open season for Norway's well-known Lofoten fisheries, taking place off the Lofoten Islands as well as further north along the coast of Troms. The prized fish is skrei, an Arctic codfish from the Barents Sea that is finding its way to more and more tables, and not just in Norway and Sweden. Markets in Spain, France and Italy have also developed a taste for this delicacy. 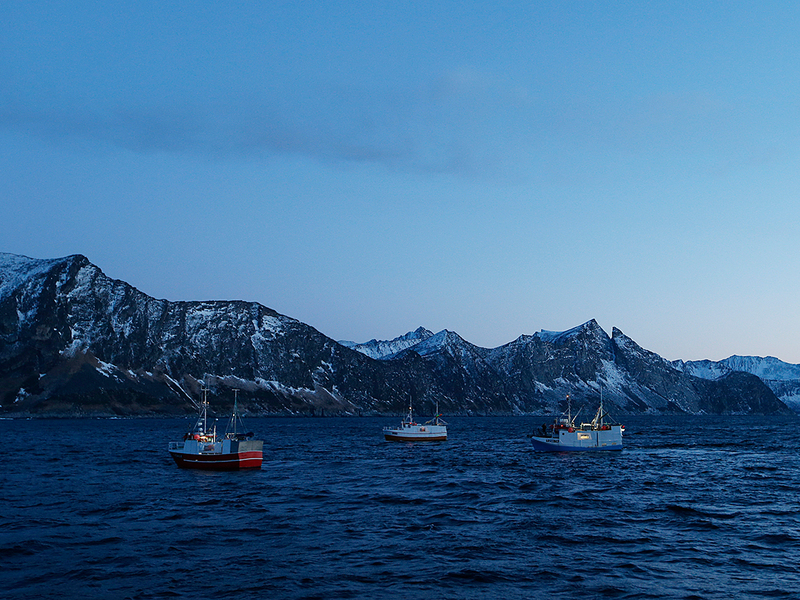 The annual cod season off the Lofoten Islands dates back farther than recorded history and has now become a tourist attraction. Increasingly, this deep sea fishing is gaining popularity among tourists seeking adventure. This year, the World Championship in Cod Fishing is being held for the 25th time. The event will take place in Svolvær 20–21 March and the list of competitors is already full. Kronprinsen får prøve seg som fisker under det tradisjonsrike skreifisket utenfor Senja. Foto: Det kongelige hoff. 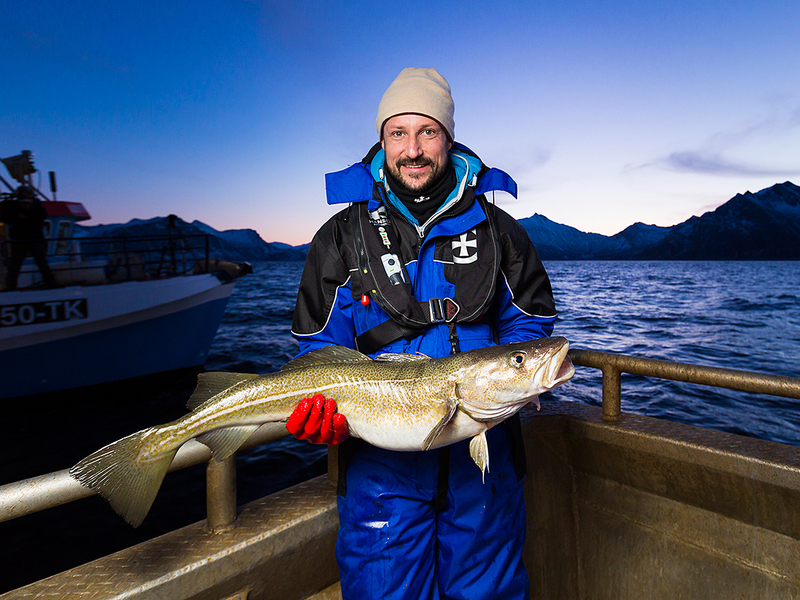 The Norwegian Seafood Council invited Crown Prince Haakon to take part in opening this year’s cod season. Photo: Marius Fiskum, Norwegian Seafood Council. Crown Prince Haakon took part in the opening of this year’s cod fisheries. Photo: Cornelius Poppe / NTB scanpix. The Crown Prince landed three cod and a saithe. Photo: Marius Fiskum, Norwegian Seafood Council. Crown Prince Haakon on the fishing vessel Senjaland. Photo: Cornelius Poppe / NTB scanpix. •	The Crown Prince was given a lesson in how to cut out cod tongues at the Gryllefjord fish dock. Photo: Cornelius Poppe / NTB scanpix. With international chefs in Hamn on the island of Senja. From left: Nils Henkel (Germany), Sergio Perez (Spain), Jostein Medhus (Norway), Alexander Østli Berg (Norway), Mike Mathieson (UK), Beatriz Perez (France) and Jonas Lundgren (Sweden). Photo: Marius Fiskum, Norwegian Seafood Council.